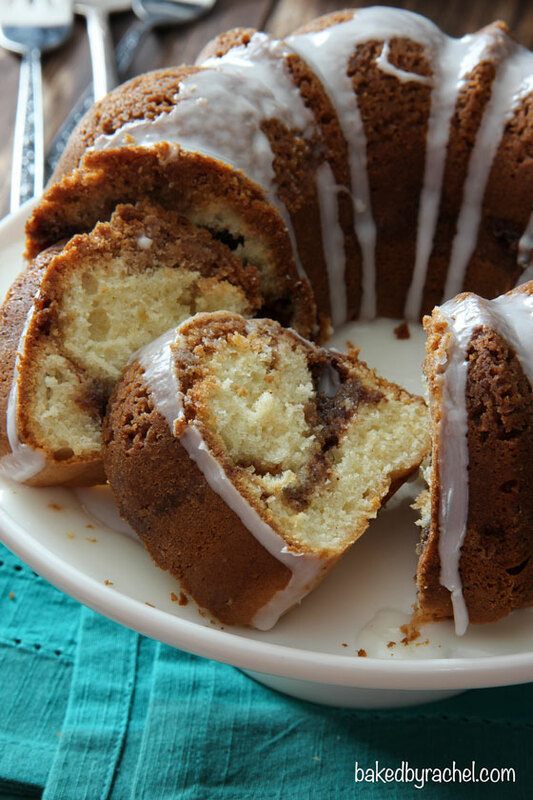 An easy and flavorful recipe for a moist cinnamon coffee bundt cake with a thick streusel topping. The perfect addition to any breakfast or brunch menu. I started off the day confused and searching for a bottle of orange juice. A bottle of juice that I not only had proof I purchased but was also 99% sure it made it into the car and brought into the house. But where was it, was the question. I searched high and low. There’s no way it could have been thrown out, surely that amount of added weight would have been noticeable. Clearly someone had put it some place because if I had put it anywhere it would have been in the fridge, or maybe the pantry cabinet because… mom brain happens, but so far not with things like that. So far anyway. Then I decided to check one last place on a whim. The shoe cabinet. No, seriously. I hid something there other day and it seemed to make sense that someone might have done the same. That someone was my youngest. Sure enough, the juice was there. A troublemaker in the making. Every since I visited Julie, I’ve been craving coffee cake. Not just any coffee cake, but super moist slices of coffee cake with big swirls of cinnamon and of course a crunchy top. I’m all for squares pieces from a traditional cake pan version but I wanted a slice, like the many slices I had from Starbucks on my visit. Seriously, that stuff was just so good. I could live off of it. Thankfully the Starbucks around here aren’t super convenient or I’d be going there too much. i.e. at really awful lights or just generally far away… and I don’t mean like 2 blocks away kind of far, but 20-30 minutes. Seriously. Anyway… after months thinking about those gloriously moist and flavorful slices, and even weeks after planning it out, I finally got around to making it. It was completely worth the wait. And now I want more. Because it’s all gone. This cinnamon coffee bundt cake is everything I was hoping it would be. Tender and moist cake with a thick cinnamon layer in the center, topped off (or bottomed off depending on how you look at it… top of the cake, bottom of the pan) with a thick brown sugar-cinnamon streusel, and finished off with a sweet vanilla icing. Breakfast, brunch, snack or even dessert… it’s perfect. And I promise, the entire family will love it. You may find they’ll even be wanting seconds. I know my girls were all but begging for more, they enjoyed it so much! 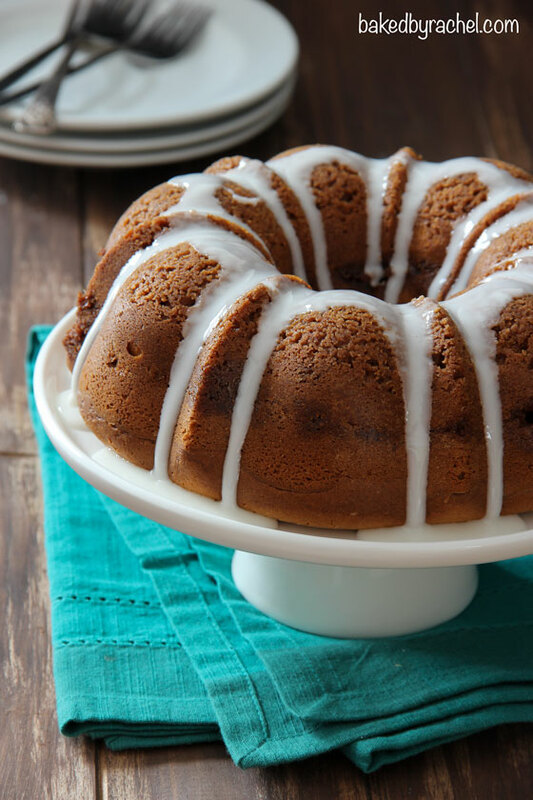 So be sure to add this tasty coffee bundt cake to your menu plans! 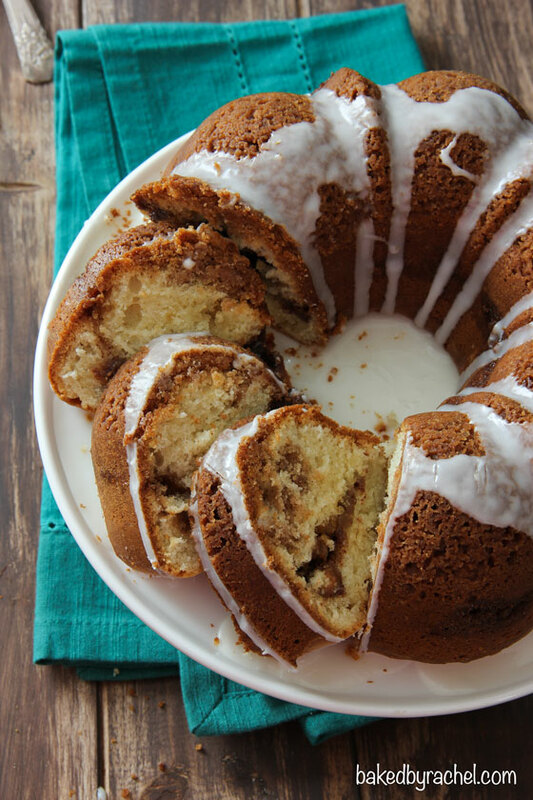 A moist cinnamon coffee bundt cake with a thick streusel topping. Preheat oven to 350°F. Lightly grease an 8-inch bundt pan. 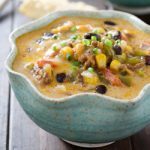 In a medium bowl, combine topping ingredients with a fork until crumbly. Break up any large pieces. Set aside. In a small bowl, combine filling ingredients. Set aside. In the bowl of a stand mixer, cream together butter and sugar. Mix in egg and vanilla until smooth. Add remaining dry ingredients, mixing until combined. 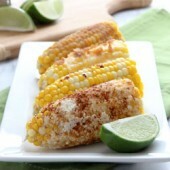 Finally, add sour cream, mixing until all ingredients are incorporated and no streaks remain. Scrape bowl as needed. Divide batter between two bowls, roughly 6 large scoops per bowl. Scatter topping ingredients into the bottom of the bundt pan. 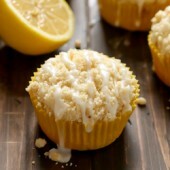 Carefully spread out half of the batter over streusel topping. Sprinkle with brown sugar filling and top off with remaining batter. Bake for 50-55 minutes or until dark and a toothpick inserted comes out clean. Invert onto a wire rack to cool completely. In a small bowl, whisk together powdered sugar and milk. Drizzle over cooled cake. Slice with a sharp knife and serve. Store leftovers in an airtight container. *This recipe is written for an 8-inch (6 cup) bundt pan. Measure your pan before beginning. Double ingredients for a 10-inch (12 cup) bundt pan. That is too funny about the orange juice! I can’t wait till I have kids and find ingredients in random places! This bundt is gorgeous! Anything with cinnamon streusel is a total win! And that drippy glaze? Be still my heart. Seriously … kids are trouble lol But at least I got a good laugh out of it when I finally found the bottle. Do you double the whole recipe or just the cake part? For best results, double the entire recipe. This looks SO good! Definitely looks super moist and I love the cinnamon swirl on the inside. 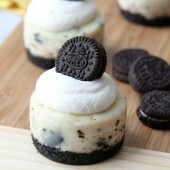 Can we bake this when I visit?! …i found my cellphone inside a freezer once after tearing down the whole apartment. I cant imagine me + mom brain. The bundt cake looks like its from a bakery.. Funny thing… I did check the freezer too! At least that would’ve made more sense being so close to the fridge. I’m always finding stuff in the wrong spot.. but I’m the one to blame. Mom brain times a thousand! This is seriously stunning Rachel! This sounds so wonderful. 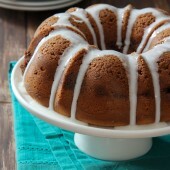 I love coffee cakes, but have never thought to make them in a bundt pan. It makes for such a lovely slice! This coffee cake looks amazing! I know for a fact I wouldn’t be able to stop at just one slice. This coffee cake looks so good! Moist and full of cinnamon and topped with that beautiful crumb, which as we all know is the best and most important part of the coffee cake! Beautiful cake and photos! Love this!! super-moist with big swirls of cinnamon and lotsa glaze. just how I prefer my breakfast cakes. :) This looks amazing Rachel! I do that kinda crap ALL THE TIME!!! My keys ended up in the mixing bowl once… And that coffee cake looks absolutely incredible. 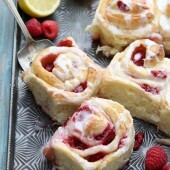 I’ve been craving one myself – I think I have to make this! 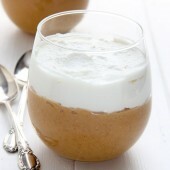 This looks so good- and all ingredients I already have at home :) Amazing! Another beautiful recipe Rachel! Your photos are amazing! Would love to make this cake this week with my family. This cake looks amazing. I would love a slice right now. I always look for missing food in the fridge. My husband loves to put things in there. I have found crackers, ice cream, and all sorts of random things in there. This cake looks fantastic :) love love coffee cake, yum! 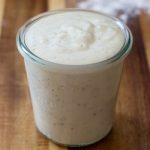 Is the 1-C measurement of flour right? Will this fit into a larger size bundt pan – its all I have? The amounts listed are specifically for the pan listed. Using a larger pan will need adjustments including ingredient amounts (unless you prefer a shorter cake) and cook time. Coffee Cake is so good. I haven’t made one in a bit, but now you have me craving one. Hi! 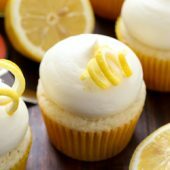 First-timer here :-) I made jumbo cupcakes with this recipe, and the cake is really really good. If I wanted to add a fruit type filling, what would you suggest? Very tasty cake! Thank you will need to triple the batter amount next time though. So glad you enjoyed it! And for a larger pan, yes, definitely increase the amount as this one is written for an 8″ bundt pan. I made this cinnamon streusel coffee bundt cake (using a yellow cake mix for the cake part because I was in a hurry) and it was absolutely delicious. I brought it to a potluck brunch and everyone loved it. Thank you for the recipe! 8-inch is a 6 cup bundt pan, so it’s half the size of the traditional pans. Doubling the batter for a 10-inch/12 cup pan was a good guess! :) I hope you enjoyed it! Rachel, this cake looks AMAZING!!!! I’m going to try it with some homemade apple pie filling that I have leftover instead of the brown sugar/cinnamon filling that you suggest. (Although I will probably try that too at some point!) I’ve been scouring the internet for recipes that I can adapt to use up some of this pie filling and your recipe is it!!!! I can’t wait to try BOTH versions!!! This time of the year, especially, I love anything with cinnamon!!!!! LOOKS FABULOUS!!! The batter is fairly thick. However it sounds as though you’re using a larger 12-cup bundt pan vs the smaller pan (8-inch/6cup) noted in the recipe. It will still taste the same but you may need to adjust your bake time since it will be shorter. Is the this right only 1 cup flour for the cake part? Yes, that is the correct amount. Be sure you’re using an 8-inch (6 cup) pan, otherwise you’ll need to double the amounts listed for a larger bundt cake. Enjoy! 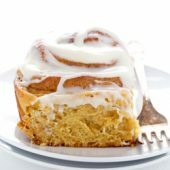 I just tried this recipe yesterday and it was delicious its even better than the pillsbury cinnamon swirl in the box.. Thanks for sharing :) Can’t wait to try your other recipes. I have made this twice and both times it stuck to the pan. I over sprayed the second time and it still stuck. What can I do? Be sure you’re using a baking spray with flour (not standard baking sprays or olive oil). Alternatively you can butter the pan and sprinkle well with flour, discarding the extra flour. This cake looks amazing in the photos but i have made it and there is definitely not enough batter. It tasted amazing but was more of a bundt pancake. Next time I would triple the batter mixture. Rachel, might I suggest that you include these instructions in the recipe as it is deceiving. I should have known that 1 cup of flour was not going to make enough batter. The recipe states twice which pan to use, specifically, an 8-inch (6 cup) bundt pan. If the correct pan is used, then you will not run into problems with the cake. Using a large pan will result in a shorter cake, as there isn’t enough batter for a 10-inch (or larger) pan. Rachel, I LOVE this cake! !…i saw this recipe three days ago n ive literally made one everyday since then…my bundt pan was huge so i doubled the cake recipe..but its soooo good its insane..the streusel turns out perfectly and the cake is super moist..i did however replace the sour cream with yogurt..(sour cream isnt easily available around here)..but its beautiful…thank you so much!! This recipe uses an 8″ bundt pan…. my pan measures 10″ from side to side. Is that how you measure? Is my pan too big? I was thinking of doubling the recipe & making muffins with the extra. How do you think that would work? Sorry I just looked at all the comments & noticed that some had to double the recipe. And, like I said if it’s too much I’ll do muffins…. I’m making it for an Easter brunch with lots of mouths to feed, so no such thing as too much! So glad you found the answer you were looking for! Doubling the recipe should work fine. An 8-inch pan has a capacity of 6 cups, whereas the 10-inch (yours) is closer to 12 cups. This cake did not come out. No way is the one cup of floyr right. You need to double the cake part. Mine was burnt and overloaded with cinnamon. If you use the pan specified in the recipe, an 8-inch (6 cup capacity) bundt pan, it will turn out as it should. If using a larger pan, the ingredients should be increased. Made this cake for a friend’s baby shower and it was delicious! Only problem was when we went to cut it, the top was really hard and the whole thing fell apart as we cut slices. Any suggestions to prevent this from happening again? I have to make something for a work get-together and would love to make this. I did use greek yogurt instead of sour cream-but have done that in the past without any issue. Thanks!!! Because of how the cake bakes, with the streusel on the bottom, the topping compresses together. You could easily cut back on the topping so it’s more dispersed throughout the top, which should cut down a bit on any hardness issues. 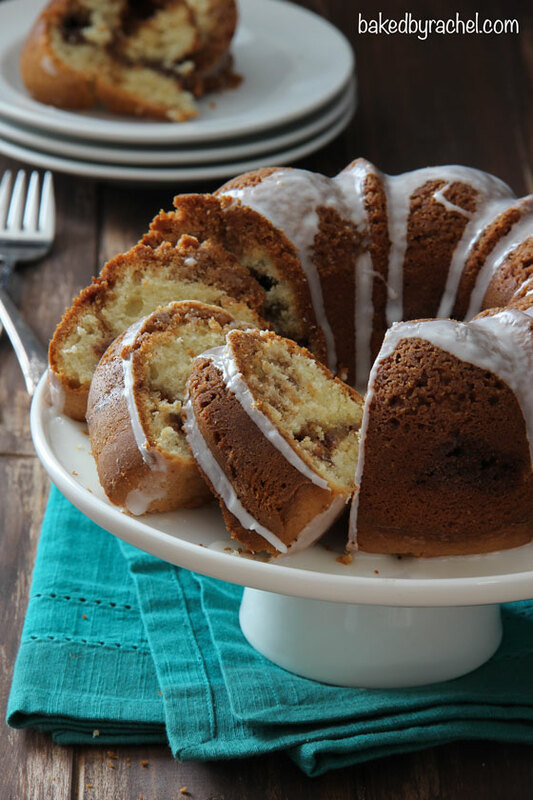 Thanks for this delicious Bundt cake recipe! I doubled the ingredients for the cake only and served it without the icing for my best friends that stopped by for coffee and dessert, it was a hit! 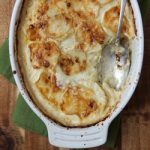 Easy to make and it popped out of the pan, nicely! Will definitely make this again! I made the coffee cake and had to double the recipe as you suggested because I have a 10-12 cup bundt pan. The top came out very thick and hard. The rest was delicious. Any advice? In the future, I would suggest spreading the topping out more or cutting back on it so it doesn’t create such a thick layer, if you’re looking to avoid that. I have a 9inch bundt pan. Should I double the ingredients or should I be okay? I’d recommend measuring your pan again to verify the size. I’ve never heard of a 9-inch pan before. I’ve only seen 8-inch (6 cup) and 10-inch (12 cup) versions. Measure the top opening across the center. You could also add water to verify how many cups it is. If your pan is the smaller size, follow the recipe as listed. If it’s the larger size, double the ingredients. Good luck! Great coffee cake. I didnt have any sour cream and used Greek yogurt instead. I used a 10 cup bundt pan. I doubled your recipe. The cake is amazing! Thanks!!! Is there supposed to be coffee in this cake? thanks for clearing that up. So its sort of like what they refer to as a ‘tea-cake’? I baked it anyway and it was delicious – thank you. Just saw this recipe. Looks delicious. When the cake is done. And you say invert onto a wire rack to cool. after baking to cool.? Or do you mean to leave it in the pan inverted till it cools and then remove it? from the pan. Thank you. Yes. If your pan has been prepared properly, it should release easily immediately. However, if you’re concerned, you can allow it to cool until easier to handle and then invert. I mean this with the utmost respect but instead of the orange juice story, I would have preferred the disclaimer that the size of my bunds pan will significantly alter the way my cake looks. How does 1 cup of flour make a cake? Typo? I just tried this cake. It smells absolutely wonderful, however, the bundt pan is only half full. It did not rise like my other bundt recipes . I’m hoping it won’t look ridiculous when I turn it over onto the plate. It sounds as though you used a larger bundt pan than specified in the recipe. This recipe calls for a smaller size (8″ with a 6 cup capacity). You’ll need to double the recipe for a 10″ with a 12 cup capacity. So, I’m just trying to make this cake right now and the amount of batter necessary to fulfill the requirements of baking this cake, are inadequate. Big disappointment. I have to make another batch of the batter, before I can put it in the oven. It is very important to review a recipe prior to starting. The size pan needed for this recipe is mentioned in three locations. It also states that if you have a larger pan, you’ll need to double the ingredients. I do hope you enjoyed the cake once you had the proper measurements for your pan size! Yes! I clearly did not measure my pan, lol. I tried to find my comment and delete, after I reviewed the astricked statement at the bottom of the recipe. Definitely user error in this case. Thank you. Would there be an adjustment in baking time, for the larger pan? Due to the extra batter and overall size, it will likely take a bit longer to cook. You can start checking around the time listed in the recipe and then based on how wet the batter still is, check every 5-10 minutes after that (checking sooner than later if it’s not as wet). Good luck!